If you're like me, you like to wear the appropriate outfit depending on the weather outside. Outfit Switcher by regi2k is the perfect mod for that. But since I'm a lazy guy, it got tedious to manually switch outfits and it took up a lot of hotkeys... not anymore !! 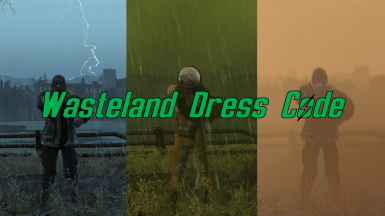 Wasteland Dress Code will automatically switch outfits depending on the weather or action that is taking place. No more getting unimmersed (is that a word?!) because you forget to switch outfit and no need to occupy precious hotkeys. This mod has NO hard dependencies. Everything gets handled via script and no existing objects are being overwritten. These plugins are optional. If you (un-)install one of these after installing Wasteland Dress Code, just go to the 'Supported Plugins' section in the holotape options and select 'Rescan'.